Highlights from the 2013 Oscars Jump to media player Daniel Day-Lewis has made Oscars history by becoming the first man to win the best actor prize three times. Bassey: 'I taught Zeta-Jones to dance' Jump to media player Shirley performed Goldfinger nearly 50 years since she first recorded the song for the 1964 Bond film of the same name. Oscars 2013: Red Carpet glamour Jump to media player Stars arrive at the 2013 Academy Awards. Oscars: Beasts director's 'fairytale' Jump to media player Director Benh Zeitlin arrives at the 2013 Academy Awards. Oscars: Stars pick their film highlights Jump to media player BBC News speaks to stars of the silver screen about their film highlights ahead of the Oscars. 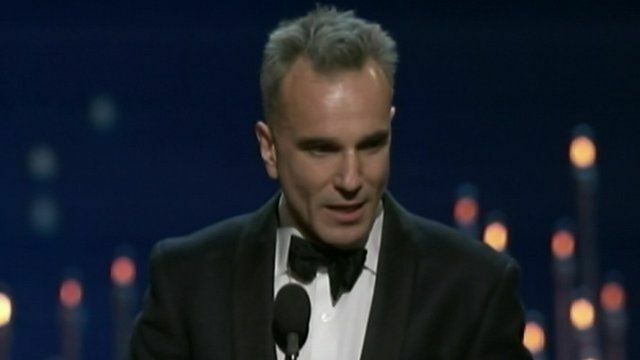 Daniel Day-Lewis has made Oscars history by becoming the first man to win the best actor prize three times. The British-born star, who had been the runaway favourite, was rewarded for his role in Steven Spielberg's Lincoln. Ben Affleck's Iran-set rescue thriller Argo beat Lincoln to the top prize for best picture. Watch highlights from the 2013 show.